Home Family Here Is To You, Sister Dearest. My sister’s name is Shade. She is married to my wonderful brother-in-law, Andrew, and together they have 3 lovely Children. She is a couple of years older than me; yet she continues to claim that she is only about 30 year old. Yeah right! That would make me, what? I will spare her and not reveal her true age. She looks great for her age and a mom of three, too. She never rebelled. I did. I almost never heard her curse while we were growing up. I did curse her out a lot and she gave me some of the best beatings of my life!!! Ouch! She didn’t talk much back then. She used one-liners, like “Stop it or I will whoop you.” Of course I didn’t listen. So she bashed me over the head. I just thought she was jealous and miserable. True, there was a lot to be jealous of. I was a spoiled little brat, I had a big mouth on me, I was rude and disrespectful, and I was doing badly at school. Yeah, I can see why she was so envious. NOT. I am not trying to make myself look bad, believe me. I am just telling it like it was. We never really hung out and she would avoid me in public especially since mom used to dress us in the same clothes. Yikes! Back then I loved it but she hated it. She would go to great lengths to keep her distance from me so people wouldn’t know we were together. If we happened to run into one another in public, I would try to get her attention and she will simply ignore me. A few times my friends doubted that she was my sister because she totally ignored me. Yes, that was my sister dearest. When I was 17 years old I left Lagos, Nigeria headed for London to join my other siblings. Within a week of my arrival we were back to our old ways. She gave me one of my most memorable beatings again. Oh you gotta love my Sis. Now let me make it clear that she is not a wicked person. I know how to stir her up and really get under her skin. It was a gift that I had back then. She never picked on me or was hurtful to me. She would simply give me a warning to stop doing whatever I was doing. My specialty was mouthing off as usual. What a real gift I had! She was more reserved and could not match my talent at cursing. So she will simply beat me up. Oh boy was she good at it too. Now you get the gist. We were never best buddies. But we cared about one another. I just see it as siblings behaving badly. However, she taught me some great financial lessons upon my arrival in London that still help me today. She explained to me what credit cards were and the best way to use them. She taught me the importance of having good credit versus bad credit. She taught me how to live within my means and not try to keep up with the Joneses, since most of them are miserable and swimming in debt. Her financial advice and guidance helped me then and have kept me out of debt until now. Having someone who taught me well before I ever got my first credit card was and still is a blessing to me. Sister dearest, is there no limit to your talent? She always has my back. She is dependable and far too sensible for her age. She is a straight shooter and always tells me the truth whether I like it or not. I like that about her and I know it’s coming from a place of love and her desire to see me do better in every way. Sometimes she is too honest, she takes one look at me after a few months of giving birth to my daughter and called me FAT! Yep that is my Sis. I love her, too for telling it straight. We just laughed it off. She can dish it out and she can take it too. Bravo Sis. While everyone was celebrating the beginning of the new millennium, I was badly depressed and nursing a broken heart, broken spirit and loosing my mind. My marriage was ending and divorce was looming. My head was spinning 24/7. I didn’t know if I was coming or going. My Sister made arrangements for me to leave London and come to Maryland with her in-laws for couple of months to clear my head. Buky was back with a vengeance and it felt good. Life was great again and I was doing it on my own terms. Destiny’s Child released “Independent Woman” and “I’m A Survivor” and those were my personal anthems. I bought the CD and replayed it all day and all week-long. I was single, strong, successful and loaded. What else could a girl need? Before I knew it four years had gone by in a flash. “Hmm,” I thought. “I am still single. I realized that my drive for success was just an attempt to fill the void in my life. But I couldn’t admit that to myself: After all, I am strong, successful and loaded. So here comes Sis again. She sent me a letter. It was a real tear-jerker. She asked me to forgive her for not being there for me. For not being the sister she ought to have been. For not sharing things that she knew could have helped me in my life. Oh, I cried an ocean. There was really nothing to forgive. She didn’t realize it,but she had been a fabulous role model and mentor to me. She followed up with a phone call, speaking to me in the most concerned and caring voice that transformed my life. It wasn’t what she said. It was how she said it. “What are you really, really doing?” she insisted. “I don’t understand? What are you after?” I questioned. “Buky, I know you,” she continued. “I know your heart’ desires. All this work, career and money are good. But that is not really you. The Buky I know wants to be married and have a family of her own. What happened?” she asked. Tears started rolling down my eyes. But I was still trying to appear strong, to not let her know how broken I felt. We talked at great length. She encouraged me to take a break from being “Ms. Independent, Single, and Strong. That break was life changing and transforming for me. Shade and Andrew prayed with me and for me. Honestly I never thought I needed that much prayer. At first it didn’t make any sense but later it all made perfect sense to me. Gradually I came to myself and God transformed my heart. I did a lot of crying, praying, and forgiving. I forgave myself and everyone else. I dealt with a lot of my issues. I didn’t even know I had issues before then. I still have a bit of a mouth on me. But now I use it for sharing the Good new and encouraging people. Once in a while I revert back to my old ways and run my mouth like cholera, but it’s all good!! LOL! My time with them was full of emotions. I felt remorseful, repentant, happy, and sad. Sometimes I resisted the change I was going through. Some days I thought it was pointless. I was definitely in denial. Remember I was “Ms. Independent, Single and Strong” (MISS) after all. A part of me loved MISS and wasn’t going to give her up easily. I discovered the effectiveness of the power of prayer. She taught me that I should stop venting my feelings like a fool and go to God in prayer. She taught me that while on my knees, I could conquer all things. While on my knees I can pray my dreams and desires through and truly see them in reality. She taught me to just keep my big mouth shut. I didn’t always have to reply or try to prove anything to anyone. Silence is truly golden. I discovered that there cannot be true submission in marriage until you have truly submitted your life first to the King of kings and Lord of lords. I met my husband, Adey, on that trip and we now have two children who are testimonies themselves. My sister is truly the best. I want to thank her for keeping it real always. She doesn’t even realize how much she has done. She is priceless! Do we still have still have our differences? Yeah! But she doesn’t beat me up any more. That was decades ago. She won’t try it now because she knows I can take her on, LOL! Sister dearest, you are one in a billion and I love you dearly. Buky, What a wonderful story. Loved reading it, thanks for sharing! So great to read from you, thanks for stopping by. What an amazing piece of writing Buky! I always admire you for being so downright honest and truthful; and more so with this piece. I love you right back! Thank you for alway being there. What a thoughtful write up! Your sister must be balling reading through this post. It is always a great thing to have a teachable spirit. A lot of people make terrible mistakes not because no one told them the truth, but because they failed to yield the warnings. They say experience is always the best teacher, but if i can avoid the experience myself and learn from someone else, i'd choose that. Love every piece of this post Buky! Being teachable is so important, i will learn from a child tomorrow and fast too. I read your blog in regards to your Sister; very interesting to know after all the beatings and mouthing-off you are still together and appreciate one another. Thank God. Sometimes siblings or friends resist the teachings because of a bad experience; especially when you don't forgive. Wow! Interesting read. I'm not sure my sister can say all these nice things about me 🙂 Its always good to have people who can direct us in the way to go. Being the first girl, i had to learn things myself with no big sister to guide me….so you know somethings were learnt the hard way. You're definitely lucky to have a big sister who cares. Your story is a big testimony and im glad you got a second chance. Being the first girl certainly comes with several responsibilities. I bet your sister have some awesome things to say about you. We should all make more effort to say them while they are still around. Also you be the one to brag on your sister, you will be amazed how much it will bless her. My sister is so full of encouragement, after a phone conversation with her, I feel like i can take on the world. Let us be each other's No.1 fan. I thank God for giving me gazillion chances, I sure could use them all, Isnt our God great? YES HE IS. I can sing His praises all day long. page.AND i WILL KEEP READING AND LEARNING. Thank you so much for reading and also encouraging me to share more. I look forward to us all sharing and growing together. Buky. You are indeed testimony. I vouch for all you have blogged because I saw all when you were experiencing the year 2000 challenges. In fact, we shared life experiences (hm, speaking of MISS, didn’t it really drive round the bend, but it did make you a very good person). This blog is really about Shade the tower of strength. She may not realise, but because you werealway on about Shade this, Shade that, in the end all of the Shade’s encouragement started to drive me too. I faced a life threatening life changing issue. Like a flash in the blue sky (NOTE: not grey) saw each other at a filling station on a Saturday and amazingly (actually, God’s plan) we met the following day at Church. From there the friendship began. It wasn’t a friendship of romance because we were both at coterminous marital points. It was a friendship of rebuilding respective lives. I can testify this before God today. I am where I am now, by God’s grace & favour, but also because through our hanging out and rebuilding respective lives I am happily married with two adorable boys. Through you and ipso facto Shade, I saw light at the end of the tunnel, the light of vision, hope, faith, and endurance. Buky, thanks for sharing! such a great story! You can pen an epistle on me. Yes you were there, what a good friend you were and always will be. You put it best "Shade the tower of strength". Spot on – because she doesnt realise it at all. I will never forget the day I met you at KICC in London, I desperately needed a new friend and you showed up. Only to find out we were both at a painful cross-roads in our lives. Your friendship helped me through and I am know that i couldnt have walked the lonely and miserable path by myselft, you are indeed a brother. When you got married and had your first son, i rejoiced with you because through your happiness i had hope that mine was just round the corner. Cheers my dearest friend and cant wait to see that blog and book you are working on. wow….. nice knowing some detailed info about my friend!!!! God is so good, B, all the time. Blog will surface (God give me strength to start). Thanks, I love the picture too, it was last minute idea but just perfect! I am still waiting on your blog girl! What great boys you have. 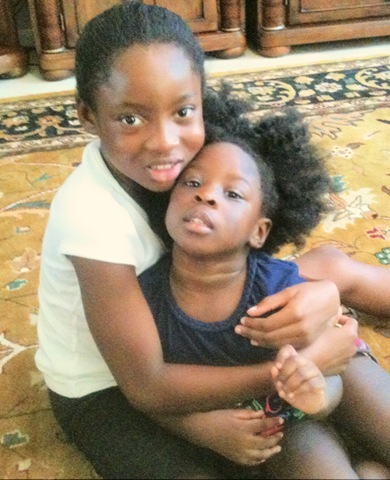 Having a sister like Buky…..
Buky having a sister like Shade, a God-given " Tower of Strength" that watches out for her…..
Having Buky appreciate her God-given sister, Shade and openly declare at the end of her write-up that she loves her dearly for the world to hear….. I thank God for blessing you with such an awesome sister and I also thank God for giving you a teachable spirit, for without that, all Shade's lessons would have gone unheeded, but God is good. I enjoy your postins. please keep them coming. The Lord will continue to increase your knowledge, wisdom and understanding in Jesus Nmae. Thank you for those kind words of encouragement. I am blessed with a wonderful sister. I thanked God for having patience with me and surrounding me with real mature people with the right spirit too. I am still learning everyday, I am a student of life. Forgiveness is so important, we cant hold on to unforgiveness and bitterness. It hinder our spiritual, physical and emotional growth. May I use this forum to publicly thank you for taking me into your home when i desperately needed a santuary. Regards to the family. I stumbled across yr blog and I've been truly blessed by it. Your piece on forgiveness helped me reconcile with a very good friend of mine and I cant even begin to tell you how much that has turned my life around. I just want you to know that you are touching more lives that you know. I'm just a random person surfing the web and yet you have impacted my life in a way that you cant even imagine. God bless you very dearly and give you the grace to keep being a blessing. Thank you very much, your testimony really blessed me. Am glad you were able to reconcile with your friend. I am so encouraged by your kind words, you dont know how much! Pls check back frequently to see what else I will be posting soon. I value your comments and feedbacks, it helps me know that we are making a difference and growing together. @ Cindy, thanks for all your support, truly appreciate it. @ Tina, Thanks for stopping by, see you soon. @ Ndidi, all I can say is, isnt she awesome? Thank you for taking the time to read and also to share. I have just dropped in from Blogfrog and read this powerful testimony. I loved it when your sister told you, "Come to hang out with me in the US, Let’s chill and let’s seek God for the next step for you". My sisters and I (all christians), are soooo close, so I understand your love for your sister and the relationship you have. Thanks for sharing. Thanks for stopping by, I am new to Blogfrog and still trying to find my way about it. Isnt it great to have lovely sisters and all Christians too. That is a blessing right there! Love UK but not missing the weather right now! Thanks for your prayers. Now am off to check out your blog.